The medicinal products market is changing. Sensitive biopharmaceuticals require more robust packages. Falsification has to be prevented with special seals and codes. And additional package features are necessary so that patients can safely administer medication themselves. Pharmaceutical companies and the packaging sector are faced with huge challenges. When the medicinal products market was still dominated by blockbuster medicines, the pharmaceutical companies had it easy: they developed active substances that could be used to treat a large number of patients and produced medicines against widespread ailments such as high blood pressure and diabetes by the millions in standardised mass processes. The big multinationals thus earned billions year after year. But times are changing. “The market for biopharmaceuticals with selective action and greater potency is growing in importance. Scientists are delving ever deeper into biochemistry and identifying new goals,” explains Klaus Raith of Deutsche Pharmazeutische Gesellschaft e.V. (German Pharmaceuticals Society). Visiogain, the British market research company, confirms this trend. According to its findings, annual sales of biopharmaceuticals are currently experiencing double-digit growth and a continuing rise is forecast for the coming ten years. This is forcing pharmaceutical companies to adapt. Some biomolecules readily decompose, while others are highly aggressive and attack the surfaces of primary packages. Containers with improved barrier properties and enhanced impact resistance are therefore required in order to reliably protect precious biosubstances. More flexible production processes are also called for, capable of precisely dosing even the tiniest quantities of active substance. At the same time, pharmaceuticals manufacturers have to safeguard their medicines better against falsification. Under the new EU Anti-Falsification Directive, virtually all prescription medicines will have to be provided, as of 2017, with a unique code number and a feature showing that the outer package has not been tampered with. Falsified pharmaceuticals are becoming a growing menace for patients. According to studies by the World Health Organisation, the falsification rate among medicines sold via dubious websites is already 50 per cent. The customs authority puts the share of falsified medicines in Europe at 10 per cent. No one is safe from product falsification. Fake and watered-down pharmaceuticals can be found not just in the lifestyle segment, but right across the range through to influenza medications. Issues like self-medication and user safety are becoming increasingly important. Injections that only doctors used to give can now be self-administered by patients. To prevent injury, inbuilt safety needles retract immediately after injection. The packages of the future will be even more versatile. The Finnish-Swedish packaging manufacturer Stora Enso and Göteborg’s Chalmers University of Technology, for example, are developing an intelligent package designed to simplify communication between patients and doctors. The package records precisely when a tablet is removed. If the doctor’s prescription is not observed, the patient receives a wireless reminder – relayed to a mobile phone, for instance. Such consumer-friendly solutions demand a difficult balancing act from pharmaceuticals manufacturers, who have to integrate extra features while also keeping costs under control. The pressure to cut costs is passed on by the pharmaceuticals industry to the packaging sector. “Today’s requirements in the pharmaceuticals sector are tough – in terms of both innovation and boosting efficiency in the drive to cut costs,” explains Richard Clemens, Managing Director of the Food Processing and Packaging Machinery Association within VDMA. Developers are therefore working flat out on new packaging solutions and improvements in equipment for the production of medicines. “Pharmaceuticals manufacturers need solutions that give them new room for manoeuvre in production,” says Christina Rettig, spokesperson of Mainz-based glass specialist Schott. The company ranks among the leading suppliers of primary packages made of glass and has developed special glass vials for biomedicines that have a super-thin lining of silicon dioxide on the inside. For coating, Schott makes use of chemical vapour deposition in which, after the reaction of a precursor gas with oxygen at high temperatures, silicon molecules are deposited on the glass wall. “The silicon layer prevents protein interactions with the package surface and protein adsorption – sensitive biopharmaceuticals thus stay stable,” Rettig explains. At interpack 2014, the world’s premier event for the packaging sector and related processing industries, Schott will be presenting, among other things, innovative solutions in the pharmaceuticals vial segment from 8 to 14 May 2014. Multi-layer plastic bottles are an alternative to glass vials. Some polymers such as polyolefins are transparent like glass but protect biopharmaceuticals even better as their surface cannot be attacked by alkaline liquid medicines and contain hardly any organic substances that might enrich bio-substances. On the other hand, the polymers are relatively expensive, which is why the industry has been hesitant to use them so far. Progress has also been made in the fight against falsification. August Faller, a manufacturer of secondary pharmaceuticals packages in Baden, has developed barcodes, alphanumeric series and data matrix codes for folded boxes and labels for the serial coding of packaging materials. The specialist uses ink-jet technology to print the packages with the serial product information, thus making it possible to trace the medicines back to the manufacturer. The demand for identification solutions can be expected to grow rapidly in the coming years. securPharm, the umbrella organisation for five medicinal product distribution associations, intends to establish a system based on data matrix codes to guard against falsified medicines by 2017. The idea is that the manufacturers of the medicines make each package a one-off by printing it with a square data matrix code containing a unique number. 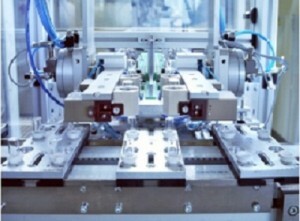 Machine and plant manufacturers have adjusted well to the new requirements of the pharmaceuticals sector. New production equipment that produces and packages medicines faster and more flexibly helps manufacturers to offset high outlay on elaborate packages and supplementary features with cost savings in production. For the identification and tracking of medicines, Italian automation specialist Marchesini, for example, has developed a track-and-trace solution whose printing module is capable of printing 400 folded boxes per minute from both sides and from the top with different security labels. A camera then checks and verifies the codes. The data are finally stored in a huge central server from where they can be retrieved at any time, thus making things exceptionally difficult for counterfeiters. Swabian machine manufacturer Bausch + Ströbel is also pulling out the stops for pharmaceuticals companies. “In the production of modern biopharmaceuticals, it is becoming more and more important to achieve highly reproducible precision in the filling process with high machine efficiency and availability in sterile conditions. “We are investing heavily in innovation, quality assurance and process technology so that we can continue to offer our customers the best-possible solutions,” says Managing Director Hagen Gehringer. The company’s innovations include a fully automatic labelling machine that labels bottles at a rate of up to 21,000 per hour and permits reel changes without interrupting production. Bausch + Ströbel and sensor specialist visiotec have also developed a process permitting the continuous control of filling processes without output being reduced by this close scrutiny. During the production of medicines, 100 per cent in-process checks are often necessary, as it is essential to ensure that precisely the right proportion of active substance is contained in each vial, syringe or carpule. Until now, the filled vials have been removed from the process and weighed, thus reducing the rate of production throughput. Instead, with their new method, Bausch + Ströbel and visiotec use sensors that check the vials in the on-going process and thus maintain high machine speed. Northern German equipment supplier Fette Compacting also specialises in greater speed and flexibility. It now claims that the rotary table press recently added to its product range achieves product changes faster than any other presses in its performance bracket. Replacing the rotor, the key component of the machine, is said to take only 15 minutes. On existing conventional presses, this process may take more than an hour. The rotor carries the filling cams that mechanically control the movement of the punches and ensure that the tablets are pressed with precision. To change the rotor, it has always been necessary until now to unscrew many individual parts. Fette has designed the component in larger segments so that it can be replaced faster. The packaging sector currently has a multitude of innovations in store for the pharmaceuticals industry. At interpack 2014, visitors can gain their own detailed impressions. Overall, about 1,100 of the roughly 2,700 exhibitors have expressed their intention to show solutions for the pharmaceuticals industry.